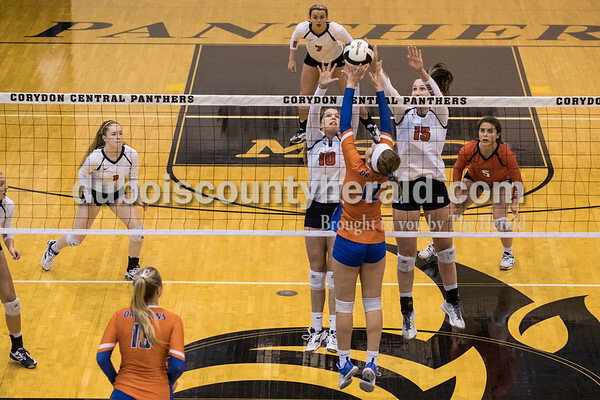 Silver Creek’s Karli Ware attempted to hit the ball over Heritage Hills’ Abby Wetzel and Grace Vinson during the Patriots’ three-set defeat by the Silver Creek Dragons in the Class 3A volleyball regional championship Saturday in Corydon. 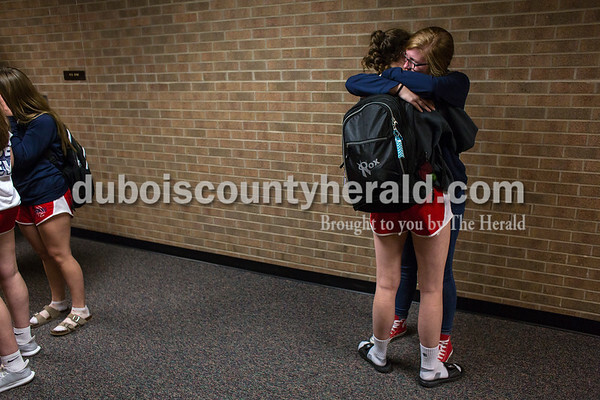 Heritage Hills’ Lilly Vance received a hug from her best friend and fellow Heritage Hills’ freshman Braili Schipp, with glasses, following the Patriots' defeat at the hands of the Silver Creek Dragons in the Class 3A volleyball regional championship Saturday in Corydon. The Dragons won the contest in three sets. 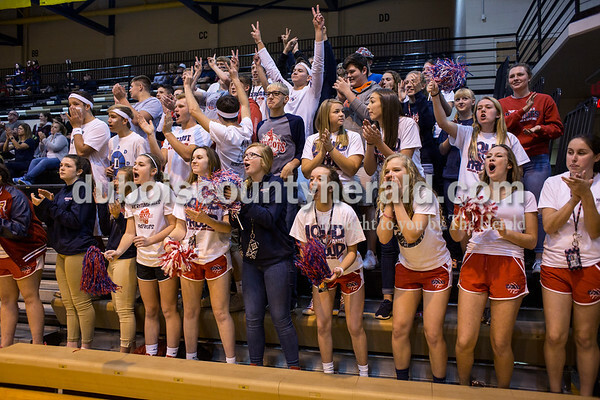 Patriot fans cheered during Heritage Hills’ three-set defeat by the Silver Creek Dragons in the Class 3A volleyball regional championship Saturday in Corydon. 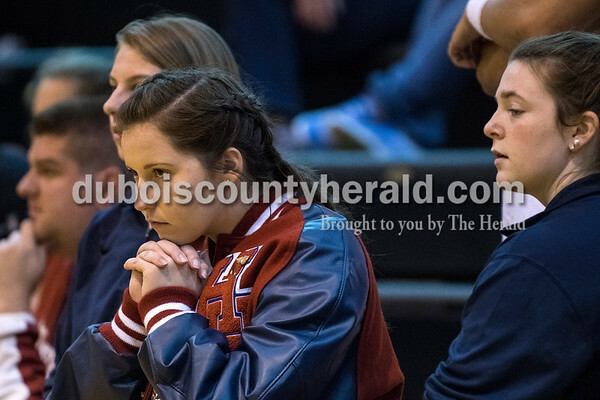 Heritage Hills’ junior Whitney Ward watched the Patriots perform during the team’s three-set defeat by the Silver Creek Dragons in the Class 3A volleyball regional championship Saturday in Corydon. 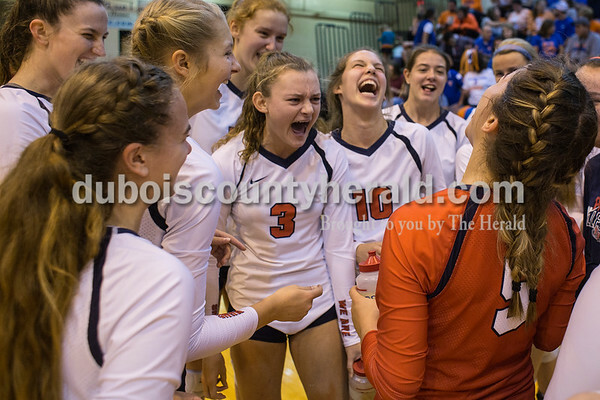 Heritage Hills’ Kendyl Brown, number 3, attempted to motivate the her fellow Patriots as the team prepared to head back to the court during its three-set defeat by the Silver Creek Dragons in the Class 3A volleyball regional championship Saturday in Corydon. 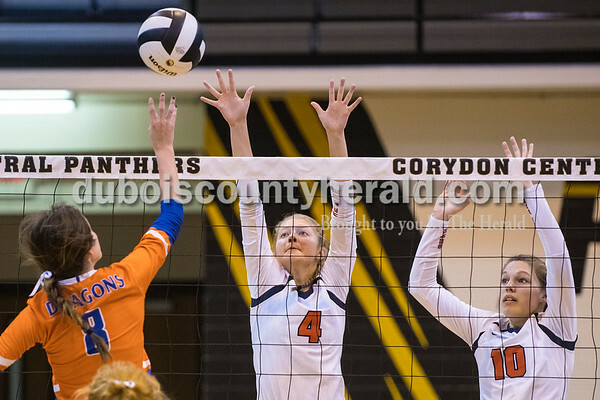 Silver Creek’s Macie Garrison attempted to hit the ball over Heritage Hills’ Grace Vinson and Abby Wahl during the Patriots’ three-set defeat by the Silver Creek Dragons in the Class 3A volleyball regional championship Saturday in Corydon. 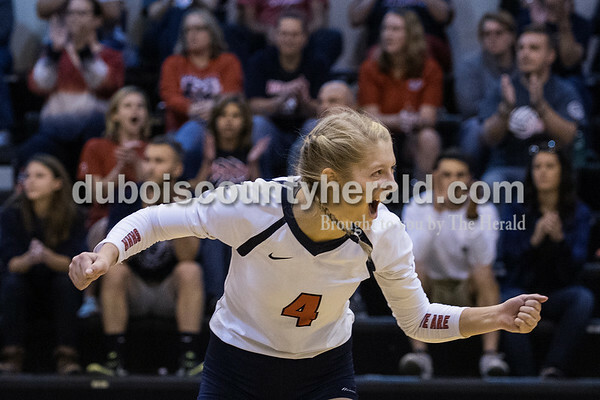 Heritage Hills’ Abby Wetzel reacted during the Patriots’ three-set defeat by the Silver Creek Dragons in the Class 3A volleyball regional championship Saturday in Corydon. 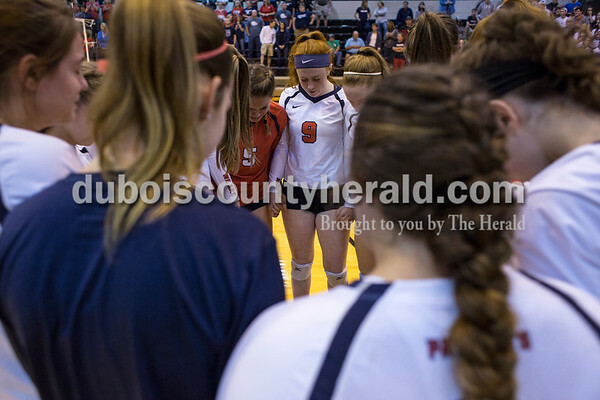 With tears still fresh on many faces, Heritage Hills’ Corrie Burroughs and Brianna Quinn prayed with other Patriots moments after the team’s three-set defeat by the Silver Creek Dragons in the Class 3A volleyball regional championship Saturday in Corydon. 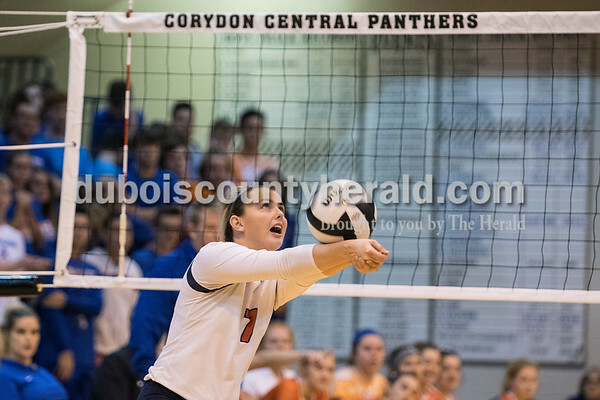 Heritage Hills’ Melissa Bell hit the ball during the Patriots’ three-set defeat by the Silver Creek Dragons in the Class 3A volleyball regional championship Saturday in Corydon. 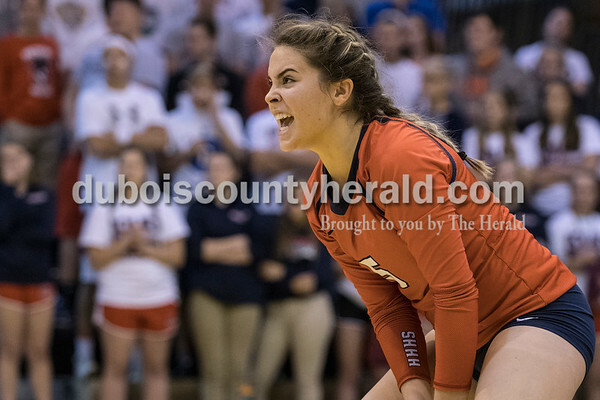 Heritage Hills’ Corrie Burroughs reacted during the Patriots’ three-set defeat by the Silver Creek Dragons in the Class 3A volleyball regional championship Saturday in Corydon. 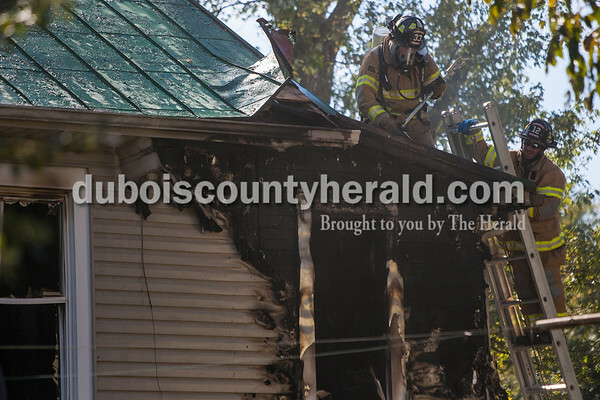 Ferdinand firefighters Steven DeKemper, Josh Stenftenagel and assistant fire chief Luke Fleck responded to call of a house fire Friday at 7875 South 75 East in Ferdinand. 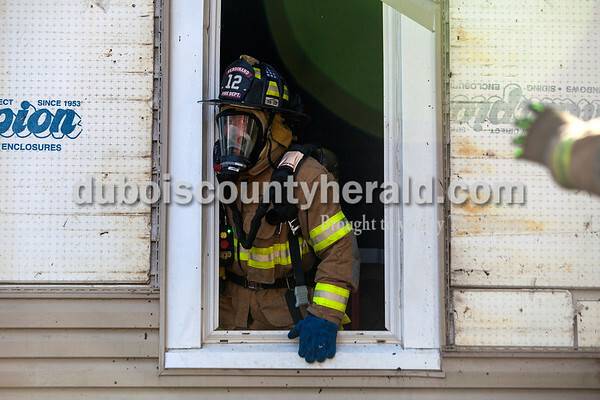 Ferdinand firefighter Jeremy Bockting looked out a broken window while he responded to call of a house fire Friday at 7875 South 75 East in Ferdinand. 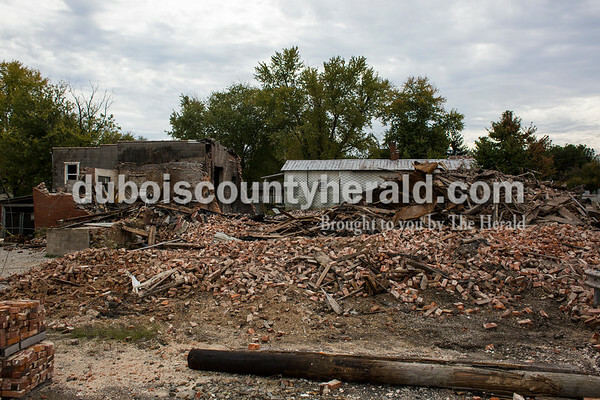 Ferdinand Fire Chief Dan Lindauer said he did not know the cause of the fire at this time. He said when the department arrived the fire was in the back corner of the house in a bedroom and bathroom where he said it was able to be contained. The chief said no one was home during the fire and there were no injuries. 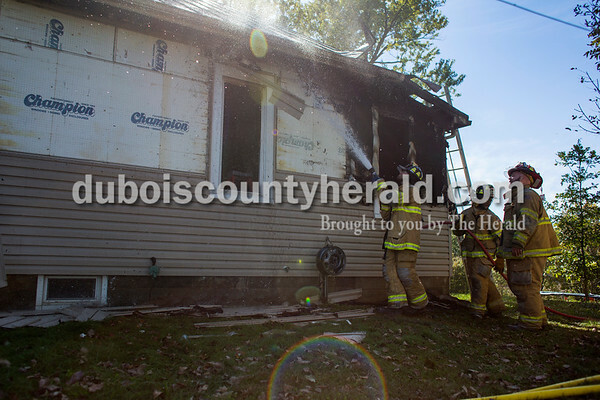 Ferdinand firefighters Heath Berg and Jeremy Bockting responded to call of a house fire Friday at 7875 South 75 East in Ferdinand. 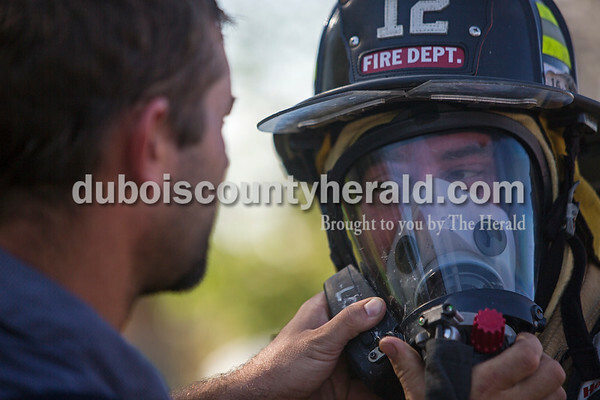 Ferdinand firefighters Josh Stenftenagel, left, secured Jeremy Bockting’s SCBA (self-contained breathing apparatus) pack while the department responded to call of a house fire Friday at 7875 South 75 East in Ferdinand. 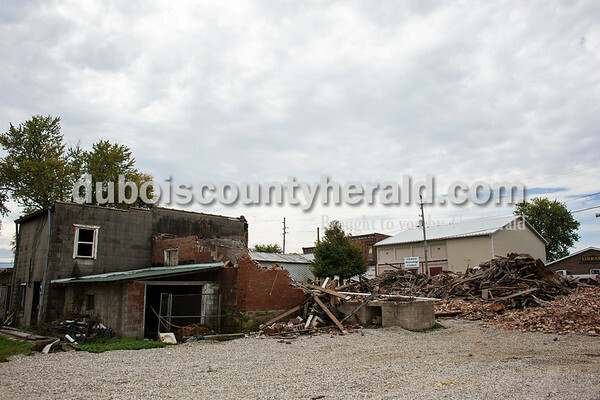 The remains of the Koerner Commercial Block building on Saturday in Birdseye. 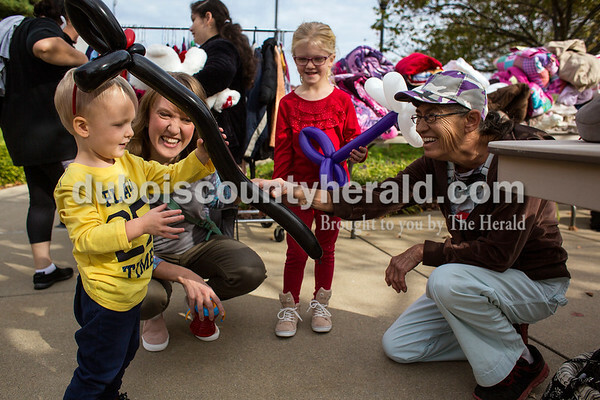 Charlie Johnson of Jasper, 2, received a snake shaped balloon animal from Elaine Dill of St. Anthony as Charlie’s mother, Megan, and sister, Bryn, 5, watched Saturday during a Latino picnic and yard sale event at St. Joseph Catholic Church in Jasper. Dill, who described herself as a “balloon artist,” said she knew there would be kids at the event so she decided to bring her balloons. Mary France of Jasper folded boxes Thursday while she helped out at Mad Batter Bakery in Jasper. To help keep students entertained during the fall break the Huntingburg Public Library hosted a game day Monday morning. "It's another day to give them hands on activities," Children's Librarian Lynn Hensley said. Four-year-old Joseph Wilmes of Huntingburg played with Squigz, a suction cup building toy, with Hensley in the library's basement. On Thursday the library will host a craft day from 10a.m. to 2p.m. To help keep students entertained during the fall break the Huntingburg Public Library hosted a game day Monday morning. Balloon artist Elaine Dill of St. Anthony visited the library to make balloon creations for fun. "I thought with it being a break there would be a lot of kids here," Dill said. "I just really enjoy doing this for them." 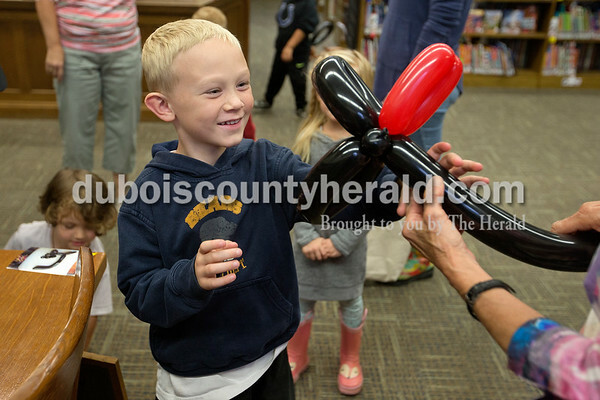 Liam Kaeck of Huntingburg, 7, happily accepted a ballon snake from Dill after playing with Legos in the library. Along with Legos and Squigz, a suction cup building toy, games like Uno and Connect Four were available. On Thursday the library will host a craft day from 10a.m. to 2p.m. To help keep students entertained during the fall break the Huntingburg Public Library hosted a game day Monday morning. "It's another day to give them hands on activities," Children's Librarian Lynn Hensley said. 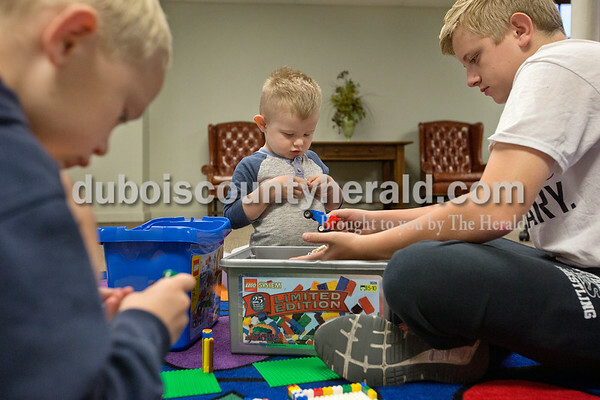 Liam Kaeck, 7, left, 2-year-old Tate Blessinger and his older brother Aidan, all of Huntingburg, played with Legos in the library's basement. Along with Legos and Squigz, a suction cup building toy, games like Uno and Connect Four were available to play. On Thursday the library will host a craft day from 10a.m. to 2p.m. To help keep students entertained during the fall break the Huntingburg Public Library hosted a game day Monday morning. Balloon artist Elaine Dill of St. Anthony visited the library to make balloon creations for fun. "I thought with it being a break there would be a lot of kids here," Dill said. "I just really enjoy doing this for them." 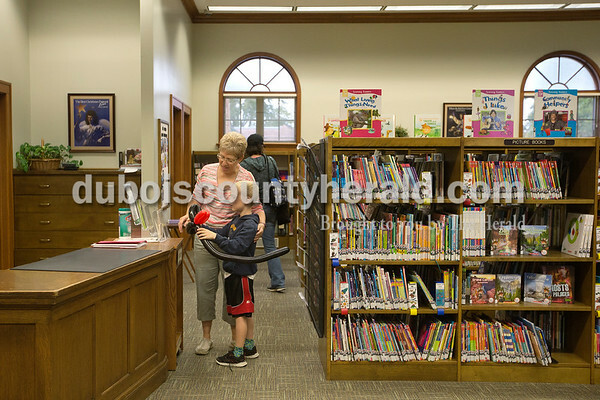 Liam Kaeck of Huntingburg, 7, showed off his ballon snake to Children's Librarian Lynn Hensley. 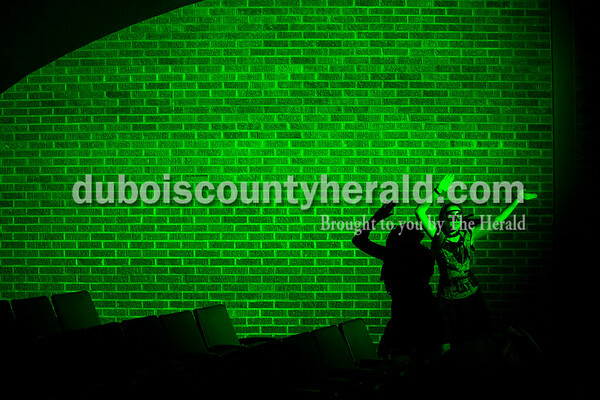 Heritage Hills’ freshman Gina Sinclair danced during a dress rehearsal for “Steampunk” Masquerade Ball of Fright on Tuesday in Lincoln City. 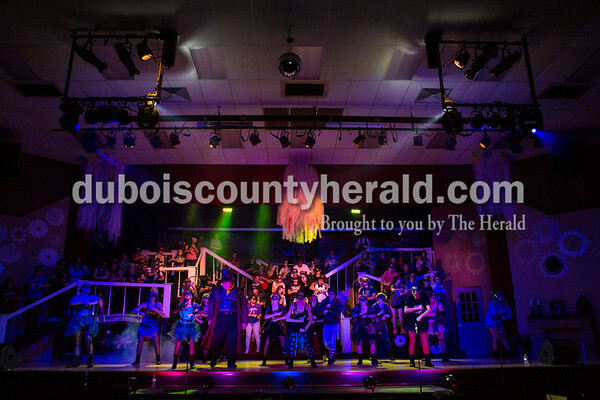 Laura Staffeld, vocal music teacher at Heritage Hills and director of the production, said this is the eighth year for the Halloween-themed production. “It’s really fun to watch them bring the show to life,” she said. 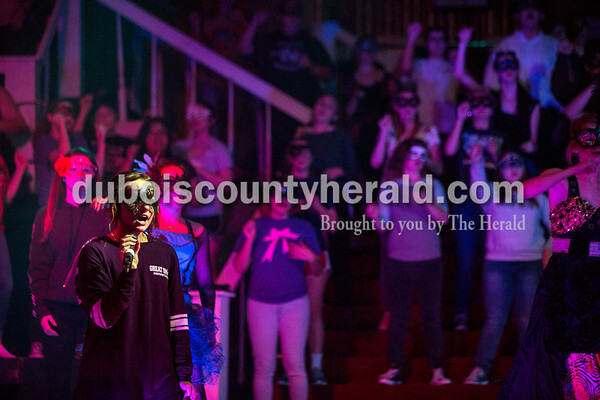 “It’s really fun to see the kids who maybe aren’t involved in much in school and then they get on stage and they’re lighting it up.” The show takes the stage Thursday, Friday and Saturday starting at 6:30 p.m. Central time in the school auditorium. 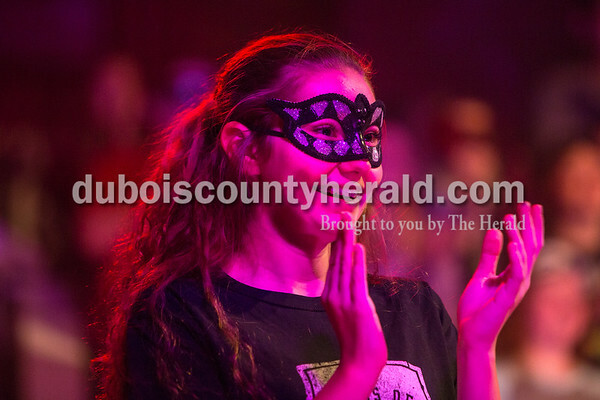 Heritage Hills’ junior Hailey Ruxer donned a mask as she rehearsed for “Steampunk” Masquerade Ball of Fright on Tuesday in Lincoln City. The show takes the stage Thursday, Friday and Saturday starting at 6:30 p.m. Central time in the school auditorium. 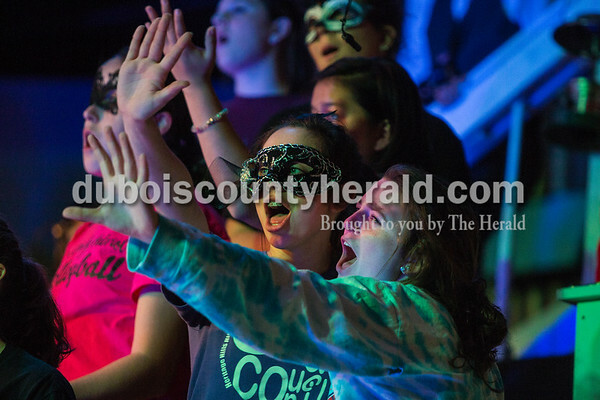 Heritage Hills’ junior Makinze Kaetzel and sophomore Shelby Miller sang during a dress rehearsal for “Steampunk” Masquerade Ball of Fright on Tuesday in Lincoln City. The show takes the stage Thursday, Friday and Saturday starting at 6:30 p.m. Central time in the school auditorium. 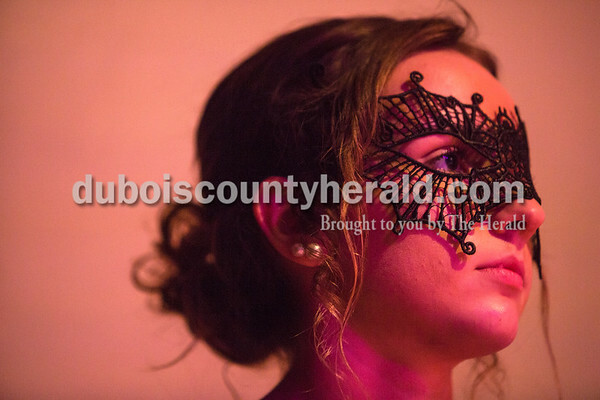 Heritage Hills’ senior Kayley Marchand rehearsed for “Steampunk” Masquerade Ball of Fright on Tuesday in Lincoln City. The show takes the stage Thursday, Friday and Saturday starting at 6:30 p.m. Central time in the school auditorium. Heritage Hills’ junior Hailey Ruxer sang as she rehearsed with other performers for “Steampunk” Masquerade Ball of Fright on Tuesday in Lincoln City. The show takes the stage Thursday, Friday and Saturday starting at 6:30 p.m. Central time in the school auditorium. Performers rehearsed for “Steampunk” Masquerade Ball of Fright on Tuesday in Lincoln City. The show takes the stage Thursday, Friday and Saturday starting at 6:30 p.m. Central time in the school auditorium. 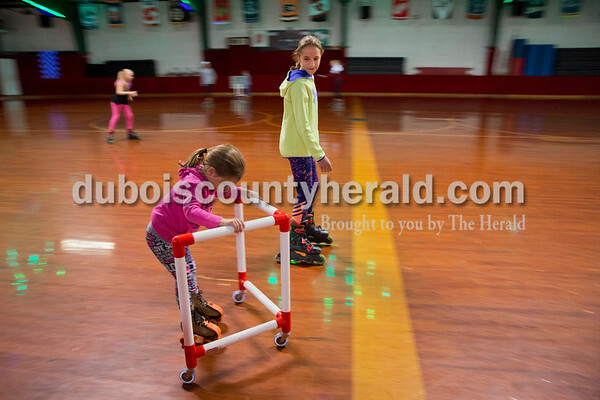 Emma Blessinger of Huntingburg, 11, center, kept a watchful eye on her sister, Adalyn, 5, as they roller skated at Skate Palace in Jasper on Tuesday afternoon. It was Adalyn's first time roller skating and her older siblings and cousins made sure she had fun. Students across Dubois County are enjoying a week-long fall break. 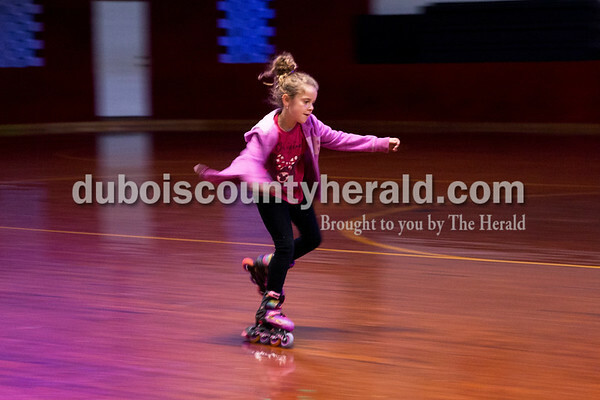 Abigail Flamion of Huntingburg, 7, skated at Skate Palace in Jasper on Tuesday afternoon. Students across Dubois County are enjoying a week-long fall break. Abigail received her roller blades as a gift for her seventh birthday. 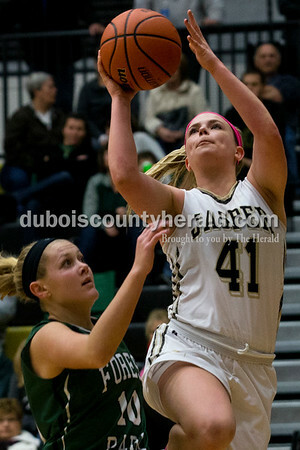 Jasper's Claire Knies jumped for a layup as Forest Park's Shelby Louden guarded her during Thursday night's game in Jasper. The Wildcats won 73-70 in overtime. 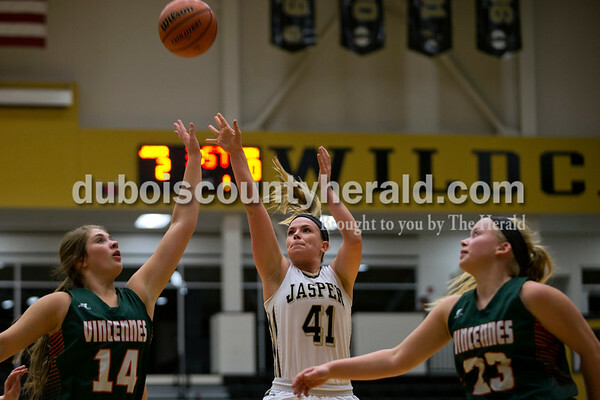 Jasper's Claire Knies lofted a shot during Thursday night's game against Vincennes Lincoln in Jasper. The Wildcats lost 57-51. 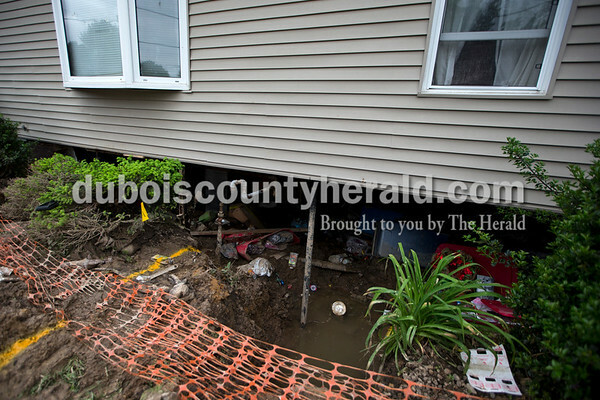 A section of the foundation and basement wall caved in under Rene Katterhenry's home in Huntingburg. 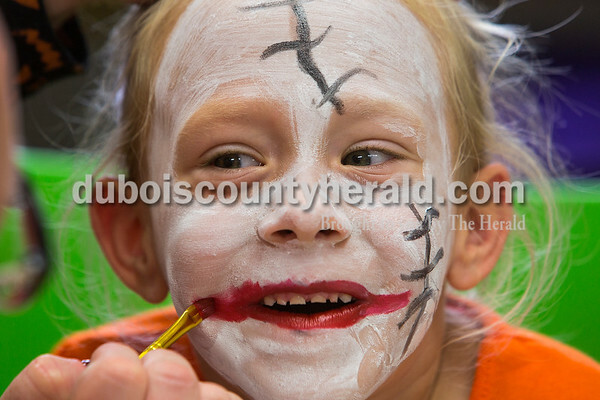 For more than 50 years the Haysville Ruritan Club has hosted a Halloween parade and costume contest for children in the area. 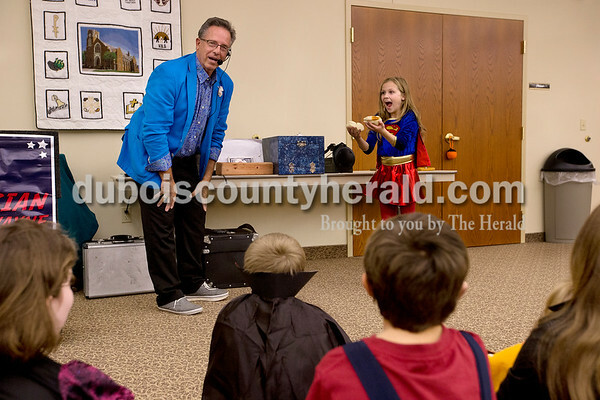 On Thursday evening approximately 22 children and their family members walked from which Christ Lutheran Church to St. Paul Lutheran Church, where they competed to see which costumes were the prettiest, scariest, funniest and most original. Following the costume contest Roger Wayne Despard of Gerogetown, Kentucky performed magic tricks. 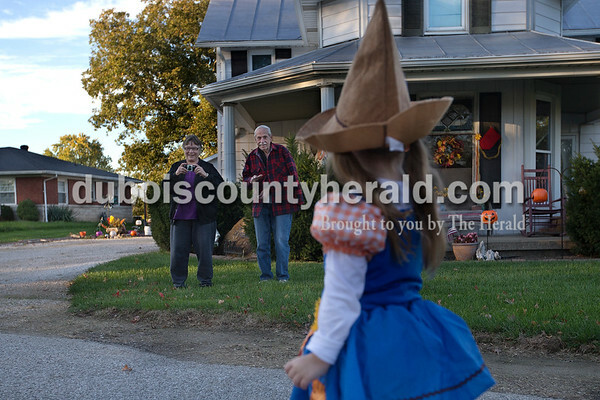 Sue and Lowell Dorsam watched their 3-year-old granddaughter Kinsley, all of Haysville, walk in the Halloween parade dressed as a scarecrow. Kinsley won first place for most creative costume. 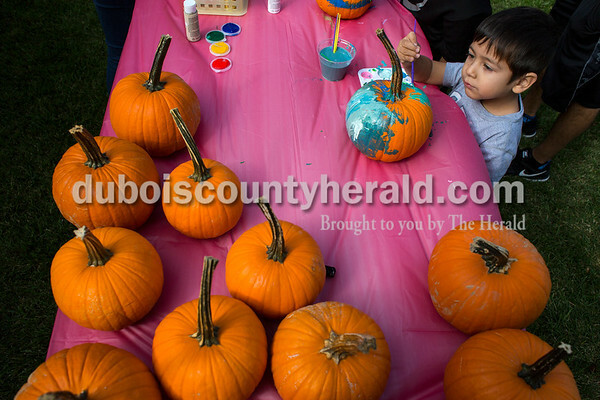 For more than 50 years the Haysville Ruritan Club has hosted a Halloween parade and costume contest for children in the area. On Thursday evening approximately 22 children and their family members walked from which Christ Lutheran Church to St. Paul Lutheran Church, where they competed to see which costumes were the prettiest, scariest, funniest and most original. Following the costume contest Roger Wayne Despard of Gerogetown, Kentucky, left, performed a magic trick with help from 9-year-old Belle Griffith of Jasper. 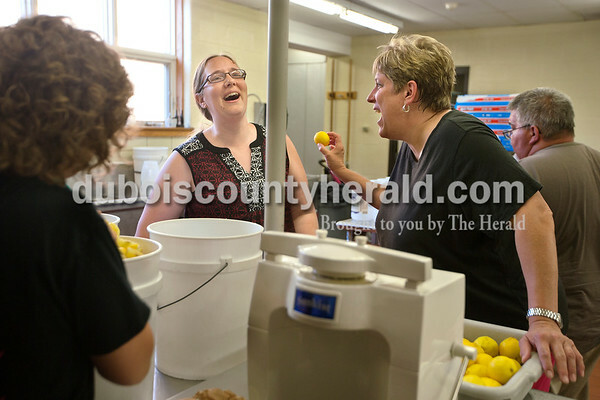 Melissa Parr, left, and Connie Brenner, both of Jasper, joked about the number of lemons they had to cut up while preparing for the Jasper marching band's lemonade shake-up stand at 10th Street School on July 12. Brenner, her husband Alan, Michele Schoenbachler, Amy Wanninger and Parr's husband Daryl spent the evening cutting and pressing 10 cases of lemons for the stand as well as mixing 40 buckets of sugar water for band members to sell at the Dubois County 4-H Fair. "I get burned out on lemonade pretty fast," Melissa said. 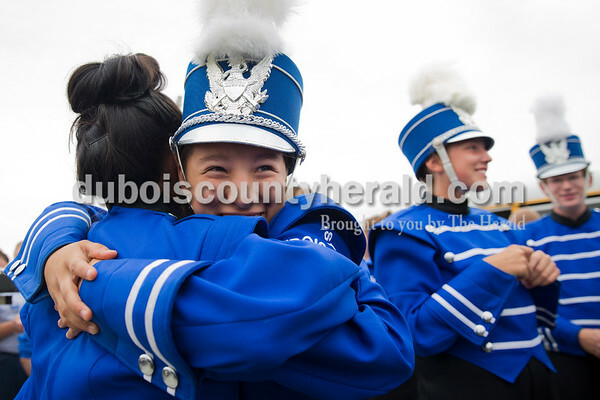 Jasper Middle School eighth-grader Jackson Clark stood still as Tina Heim of Jasper helped to fit a marching band uniform on him July 13 at the high school. 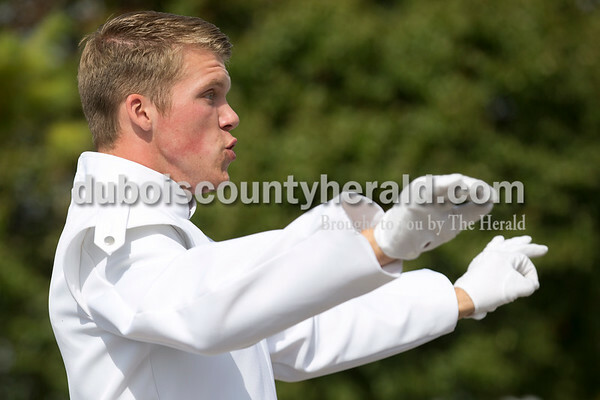 Heim has helped out with the band for the past 6 years by working on different committees. 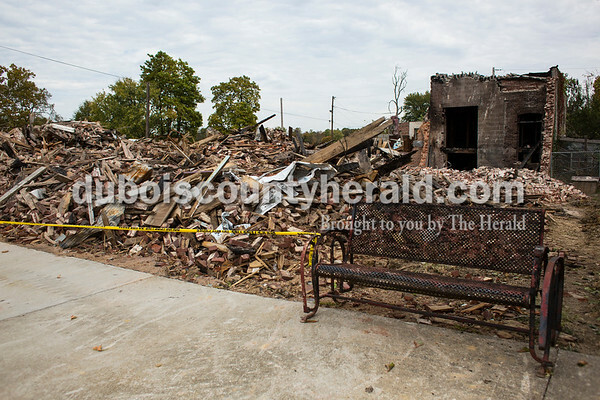 "The first time I did this I remember thinking 'this is chaos'," Heim said. "But the kids are so kind and patient that everything went much smoother than I expected." 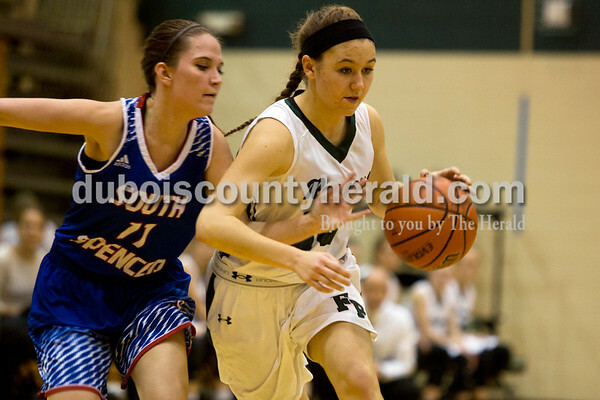 Once all of the uniforms are fitted Heim and Audrey Fischer took home whatever bibs needed to be altered. 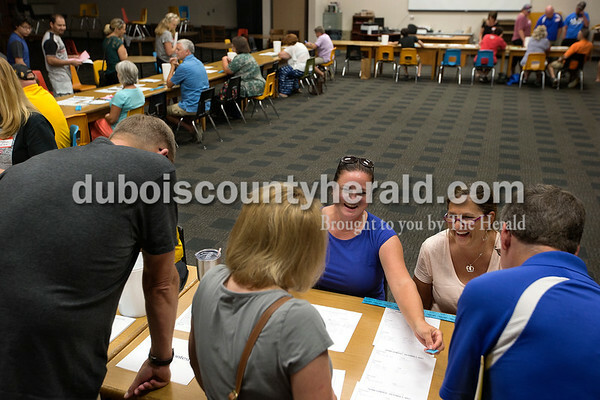 Dana Buechlein, left, and Audrey Fischer joked with parents as they signed up for different activities to help the marching band throughout the season during the band's annual Burger Bash August 13. The band parents do many things throughout the season from running concessions at football game, serving as chaperones on the bus to moving props and pit instruments on to the field for competitions. "At first I dreaded it," Fischer said of joining the different band committees. "I didn't think I was ready for the responsibility but once it started I couldn't imagine not doing it." 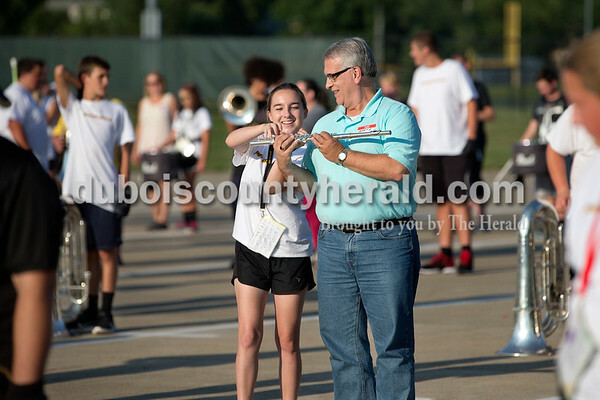 Jasper senior Carly Vaught, left, showed her father Marty how to hold her flute while marching during the band's annual Burger Bash. Parents gathered at the school to get information about the band and to sign up for different things to help run the band from working the concessions at football game to being a chaperone on the bus. 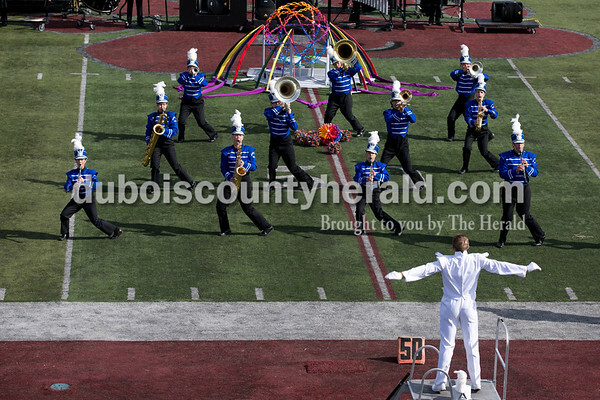 This is the first time the Jasper High marching band used many large props in its' show. 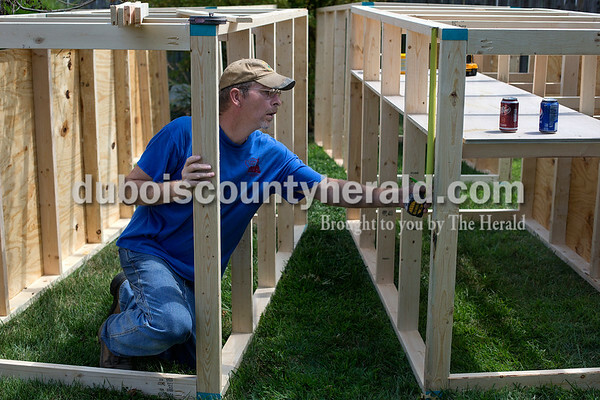 Starting at 8 a.m. the morning of August 19 a group of dads gathered at Jim Schoenbachler's backyard in Jasper to construct four large boxes, two small boxes and steps. John Dixon of Jasper measured one of the boxes which will serve as a prop and storage for uniform changes. "We could not do any of this without the support of the community and the local businesses," Dixon said. "The wood for the props was donated by MasterBrand." This year the Jasper Band Parents Committee raised $105,000 to support the marching, concert, symphonic and pep bands.